"I know, I know, This page is long, but it's my story, and I hope you all will read it...I think it's incredible!" 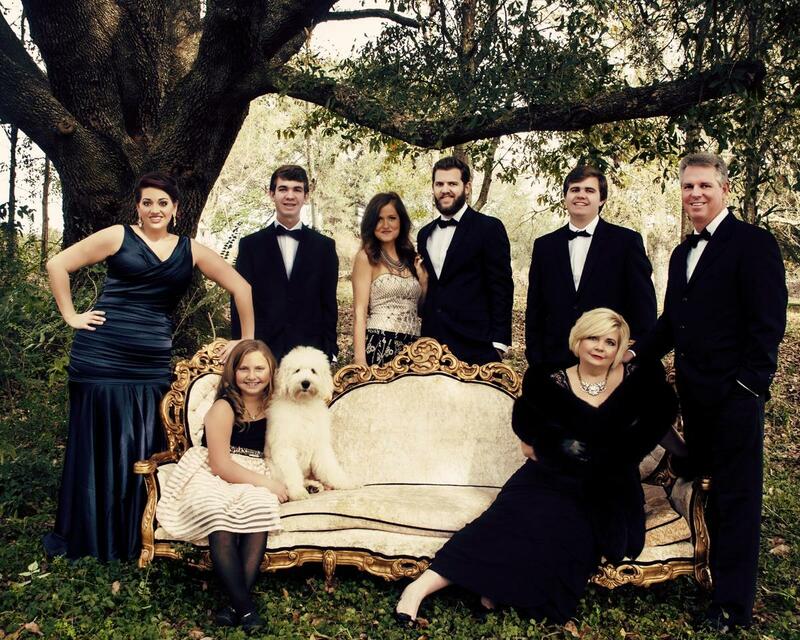 My husband Judge Smeraglia and I, raised our five children (Lauren, Jacob, Lukas, Joseph & Natalie) right here at Smeraglia farm, along with our Teddy Bear Goldendoodles and Teddy Bear Schnoodles. We are dedicated to the research, development, and training of our dogs. We are 100% committed to producing healthy, sound, well-tempered, and well-trained puppies that will become beloved, Service Dogs, Therapy & Companion dogs and family members for years to come. LOVE GOD. LOVE PEOPLE. LOVE DOGS. (This is truly who we are). Okay, that's me on the couch, the owner and heart behind the program. I have loved dogs since I was a child, but my Mama would not let me have a dog because she was a super neat freak and could not bear to clean up after a dog. When I was six years old, we were having the constant discussion about why I could not have a dog. I was so upset with the whole situation and angry at my Mama, with my hand on my hips, I said, "When I grow up I am gonna have a house full of dogs," she responded, "well, I won't be coming to your house." I laugh when I think about that, but that was a self-fulfilling prophecy. I now have all the dogs that I want, but my Mama did rub off on me, because I am super OCD about cleaning as well, and I rotate the dogs and puppies in the house because they have to be trained and have manners. My parents ended up building a home right behind me on our property, and my Mama comes over every day and helps me run my home. She is starting to like dogs just a little, and she has been caught cleaning up after them from time to time. My Daddy now works full time on the Farm, and my staff all call him Pawpaw. We all owe a lot to these two, without them there would be no Doodles to LOVE... LOL! We are a Christ-centered, client-focused, Doodle loving company. We are committed to providing the highest quality care for our dogs and clients, in a manner that glorifies God, in an atmosphere that is professional, upbeat, unpredictable and shall we say unique in every way. The English Golden was my passion for many years, I spent most of the 90's, raising my two oldest children and my amazing English Golden Retrievers. They are one of the most beautiful dogs in the world. English Goldens look different from American Goldens. They have a large blocky head, soft plush face, broader shoulders and a softer coat. They have incredible laid back personalities, which make them excellent companions. The only problem, they shed buckets!! When my third child was born, he developed allergies to dogs, and this presented a significant problem for our family. My son could not breathe around my Goldens. Little did I know the path that I was on was going to open up a whole new world to me. I was always being contacted by Golden Retriever lovers that desperately wanted an English Golden but they had the same problem I had, they either had a child with dog allergies, or they were allergic to dogs. It was at that time that I was introduced to the American Goldendoodle, but no one had ever bred the English Golden Retriever to a Poodle for English Goldendoodles. 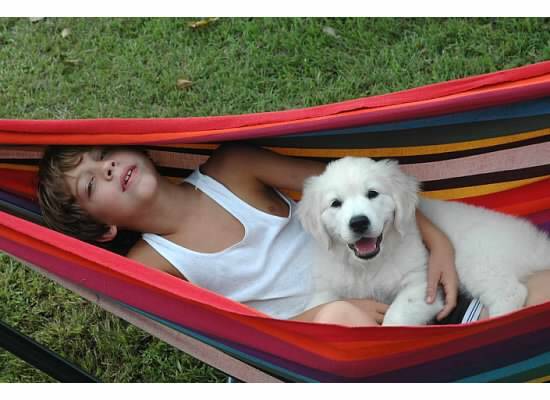 I may have never entertained the idea of breeding my English Goldens to a Poodle before my son was born, but once we realized his allergies to dogs, we knew we had to find a solution for our problem. I realized that the Goldendoodle might be the best alternative for our family. I began contemplating breeding my amazing English Goldens to the Clownish Intelligent Poodle, which would be the world's first English Goldendoodles. We eventually decided to go in the direction our heart was leading, and I bred the world's First English Goldendoodles. "Fletcher, The Very First Teddy Bear English Goldendoodle." This newly released story makes a great gift for any child or Doodle Family. Once it is signed by the author and gets Fletcher's stamp of approval, complete with sloppy doodle kisses, this book will quickly become a coffee table favorite! Smeraglia Farm in Robertsdale, Alabama is a very special place. It is the home of the five Smeraglia Children and the birthplace of Fletcher. When the family pet, a handsome, loyal and charming English Golden Retriever named Murphy, can no longer get his favorite belly rubs because of Natalie, the youngest of the Smeraglia children is allergic to him, everyone is sad. Things change when a new girl comes to live on the Smeraglia Farm. A beautiful, intelligent and hypo-allergenic Standard Poodle named Georgette joins the family. All - especially Murphy love georgette. 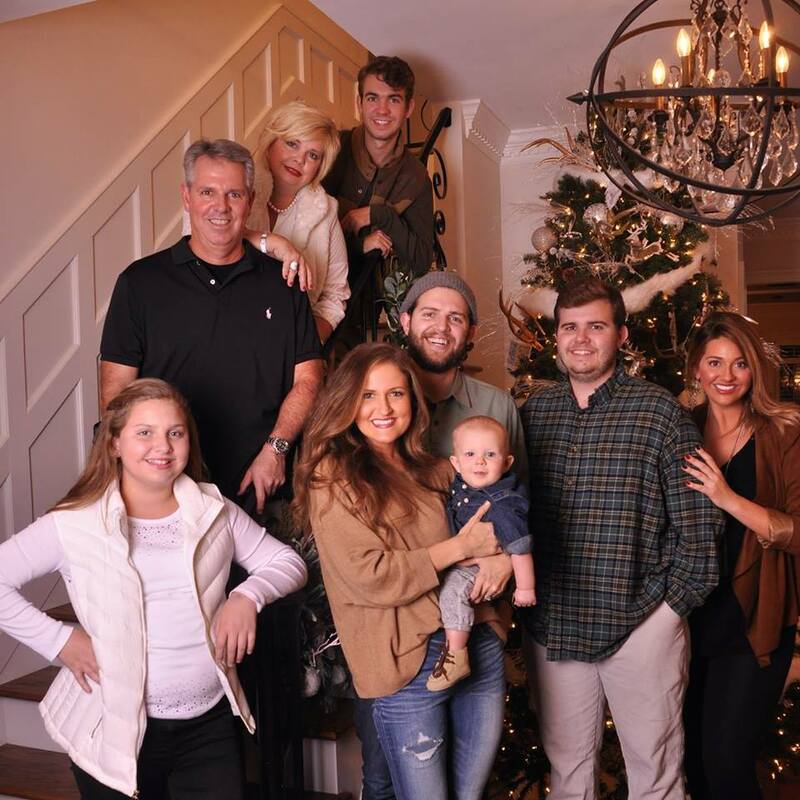 One Christmas morning the family gets a big surprise, and we are introduced to FLETCHER..... 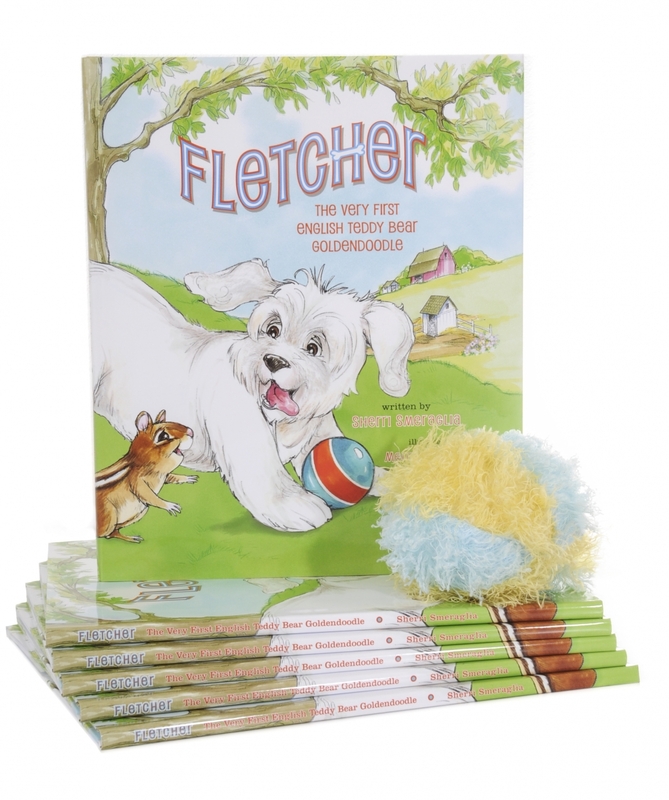 In this charming book, you will meet Fletcher, the very first Teddy Bear Goldendoodle, who is the cutest and most clever puppy of all. I was not sure how I would feel about this new breed in the beginning, but after much discussion with my husband and friends, and lots of prayer, we felt that this was the direction that we were being led to go into. It was a scary time because I had a lot of friends that were pure breed advocates that I was afraid would turn their backs on me when I crossed over. Thankfully most were okay, and I can honestly say they all accepted my new project. I can remember my first litter, I was so amazed at how much they looked like little Goldens, but as they grew they developed these cute little ripples that eventually made them look like fluffy little Teddy Bears, I was in-love the moment the first puppy was born. These little English Goldendoodles had stolen my heart and I became the proud breeder of the first English Goldendoodles, and coined the term "Teddy Bear Goldendoodles." The Goldendoodle puppies were the perfect solution for our allergy issues, but my son was still extremely allergic to the Golden parents. My husband and I discussed this at great length, and we came up with the perfect plan to develop our breeding & training program while keeping our children, allergic to dogs, healthy. We designed a one of a kind resort-like facility to raise our doodles and a beautiful office to meet with our clients. We wanted our Goldendoodles to have a place that would simulate our home; this would be the place that I would be spending most of my time. I wanted it to be an amazing place to for our staff to work, our clients to visit and our dogs to live. We love to have the guests, and our office was designed to be a warm, friendly environment for our potential puppies owners to spend time with us and to meet our puppies. I can honestly tell you that you can go all over the world and you will never find a place like Smeraglia; this place is as unique as our name, and our dogs are just as unique. You can spot a Smeraglia dog a mile away. I have heard this by almost every person that makes the trip to Alabama to meet us. As a mother of five children, I have spent a lot of time in labor and delivery rooms, and I wanted my puppy nursery to be just like the baby nursery that I had been in, and that's exactly what it is like. I have had many people tell me that they have never seen anything like this. We are so happy with how things turned out. It's been wonderful for my son, my beautiful parent dogs, for the puppies, and for me. It's amazing. We now have this brand new very elaborate state of the art nursery that is the home base for our parent dogs to bring their babies into the world. Our dogs have the very best there is to offer. We have heated and cooled inside rooms, large airy outdoor playgrounds with lots of shade, and a large pond for the dogs to swim. We have a brand new birthing room. 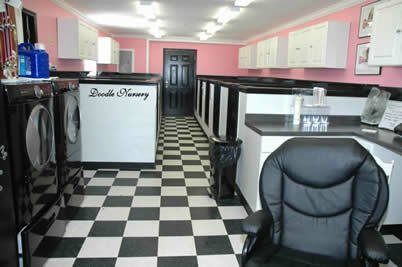 It's decorated like a 50's Diner, totally pink & black and very cute. It has a washer and dryer, 36" Plasma T.V, beautiful, roomy private birthing areas and is staffed 24 hours with surveillance, when we do something we do it right and we spare nothing when it comes to our dogs, if they need it, we get it. I was in Dentistry before I decided to go full time with my breeding program. I was very much about infection control. I have a reputation for being OCD on cleaning. That's one reason why I have so much around the clock help. I want my puppies to be clean and cute at all times. We wash puppy pads and clean up after our puppies all day & night. I also want all my parent dogs to be groomed and beautiful at all times. That's why we have a fully equipped grooming room. It's also pink and black and charming. 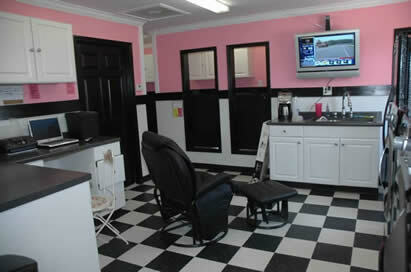 We have a fully equipped medical office in which my veterinarian can come and vaccinate and examine our dogs. We have an ultrasound machine and full lab. Everyone tells me I should have gone to vet school instead of dental school. Although I do run things like a Dental practice, I like things just the way they are, I get to do all the fun stuff, and my vet gets to do the less desirable things. I love the reproductive side; we do lots of A.I's, Microscope evaluations, and ultrasounds. It's so precious to see the babies before they are born. This is now my full-time profession, it's a lot of work, but it is truly a labor of love for me. I recently sold my online company and gave up dental hygiene to be available all day to care for my babies. I love taking care of these precious little ones. I know that it's important for you to be able to see where your puppy was raised, so I have included lots of pictures and videos for you to learn more about us. I have also added the "Our Staff" page to introduce you to the dedicated people that work alongside me. There is no way that I could do all the things that need to be done every day without my dedicated staff. The reason is that I do all kinds of socialization techniques on every single puppy and we expose each puppy to 100 new sites and sounds from day 36 to day 50. There was a time when no one was ever getting a call back from me, about a puppy, because I was always with my dogs, puppies, and family. 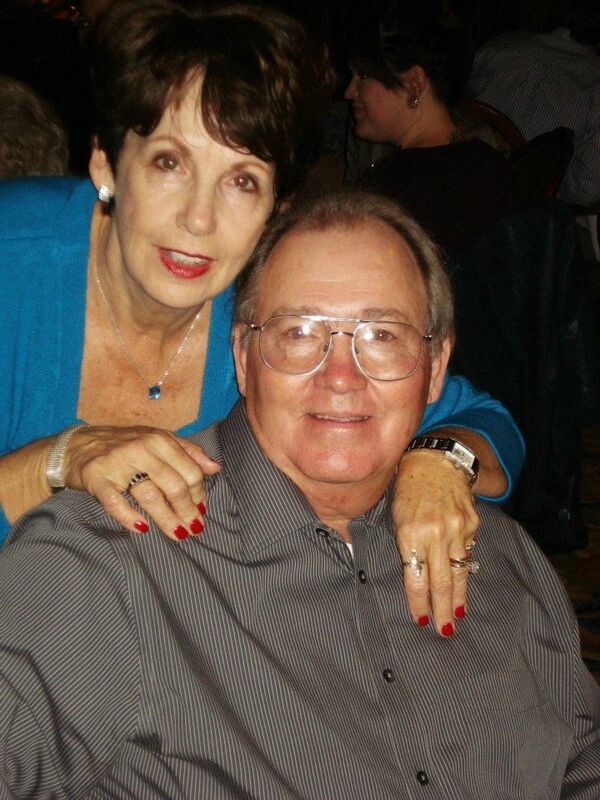 Thankfully, God sent me the help that I needed so that my clients could always get the help that they needed, while I am in and out all day caring for the needs of my family, dogs, and puppies. I am always here for anyone that needs me, but I have spent a lot of time training my staff, and they are truly an extension of myself. They also get to know every puppy on a personal level, so they will be to able to answer most questions, and if not I'm always nearby. When you are as passionate as I am about what you do, things just naturally developed out of necessity and that is exactly what happens here at Smeraglia Farm. We realized a need for qualified training, expert grooming, tried and true products and lots of photography requests. I am all about excellence, and that's why I developed these programs for our clients. Doodle Prep School - We all love our work, and it truly shows in our beautiful puppies. It's amazing how things develop when you love what you do. After breeding for 28yrs, I had my first litter in 1985. I learned that the greatest threat to the lives of our puppies is behavioral issues. The fact is that a well trained, mannerly puppy, has a better chance to have a forever home; so in 2007 we started our puppy training program, "Doodle Prep School." This is an exclusive training program for our doodles to attend before they go home to their new families. 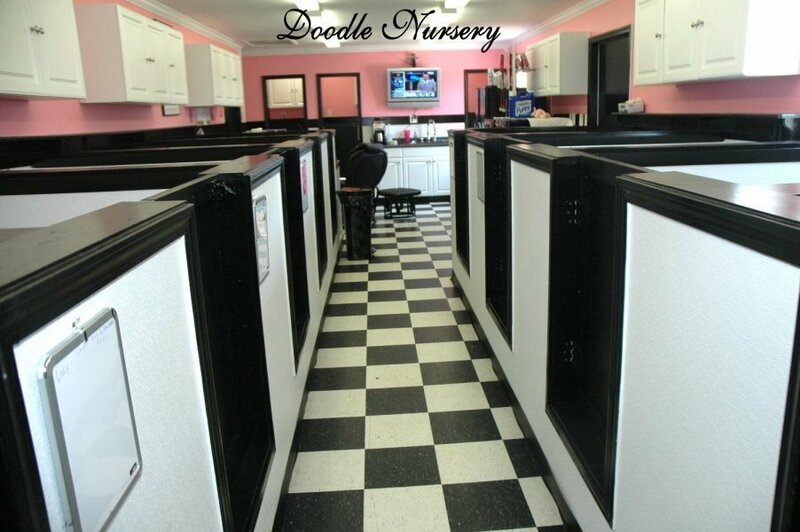 Doodle Prep School has proven to be extremely popular. Once we began training puppies, we realized the great need for dog training of all ages, as well as the need for Therapy & Service Dogs. Smag Dog Pet Products - We also know a lot about dog products, we spend hours on the phone and in emails discussing the different products that we like, and why we like them, so to save time and allow our clients to buy our favorite items, we opened our online Pet Boutique. This is another reason why I appreciate my staff; I could never handle all the calls that come into my office in a day. Groomers Available - We also have Smeraglia Trained Doodle Groomers that are available for Doodle grooming several days a week, by appointment only. Doodle Pawtography - Everyone loves our cute little puppies, and we love taking pictures of them, so like every new baby we began taking professional portraits of our puppies and you guessed it, everyone one was requesting special photo sessions of their puppies before they came home...well our love for our dogs and our love for photography has opened up a whole new way to show off our doodles ....we call it Pawtography, now you can visit doodle Pawtography. Come to see our work. Things have truly changed since that first litter of doodles, but one thing that has not changed is our total love and dedication to the Doodles. As you can see our doodles are amazing, we love them; it's this love that has driven us forward... Please read our website, look at the pictures and videos. I know that you too will fall in love with our beautiful puppies. Thank you for taking the time to read our incredible story and to let me share my heart with you.